Smode way to deal with fractured geometry? Recently I've been testing the limits of what can be done with sMode and what can't. What I'm trying to understand now is how sMode approaches imported fractured geometry. All I want to do is to fracture a simple text mesh in Blender, import it to sMode, and, once there, animate its explosion originating from the beginning of the text mesh and spreading forward. Is there anything specific to sMode I should take care of within the said pipeline? How do you envision the ideal sMode pipline with fracturing in mind? As far as I know there is no physic (except for particles system) in smode. You can export your blender scene as fbx scene and import/reference it into smode. As you have many object (and many materials) you may be forced to import because reference is only compatible with 1 object and 1 material per object. I see, but is there a way to handle chunks of the imported mesh as instances and affect them by using modifiers? For me as a demoscener, control over animation and sync is essential. I like how it's implemented in Element 3D here. There are no facilities to handle dozens of fractured sub-objects yet. 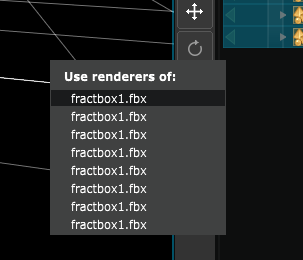 You can however reference sub-parts of a given FBX manually: drag and drop your fbx file into your compo > select "Reference" > configure parameter "Sub Geometry To Use"; do this as many times as required, the fbx file content is shared internally. Thanks, for the info. I imported the fbx file as a reference, duplicated it and changed the 'sub geo to use' param for each of the duplicates, then grouped all the duplicates under a 3D Group. Looks like I can't apply modifiers to a 3D group at all. It turns out I have to apply them to each 3d group member individually. Not good for motion graphics. Should be improved imo. Hi @Skinnytorus, I'd be curious to have your FBX example file to have a look at it? Could you send that? I would if I could. The matter is that I can not attach anything that's not jpg, jpeg, png, gif, or compo. Would it be a problem allowing more attachable file formats for me (e.g. .zip) at least in the Lounge area? For 3d groups, it sounds very delicate to implement: when you have a 3d group, it means a collection of objects that can be displayed on screen. Smode does not know anymore how this object are constructed at this point. 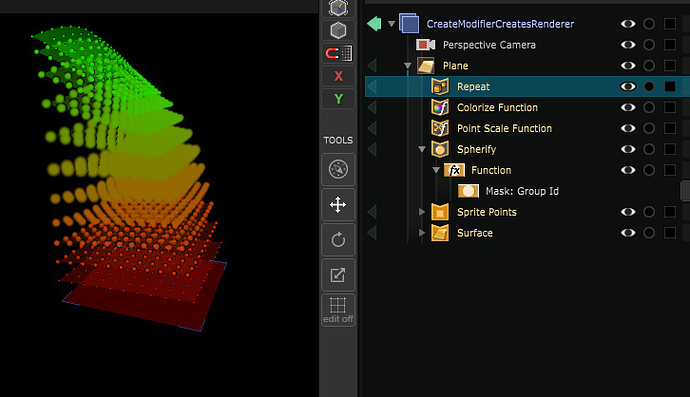 Having modifiers on top of 3d groups would have a very special meaning telling something such as "stack an instance of this modifier on top of each 3d generator you cross inside the scope of the 3d group". Sounds like a rather complex behavior, both on dev-side and on user-side in my opinion. 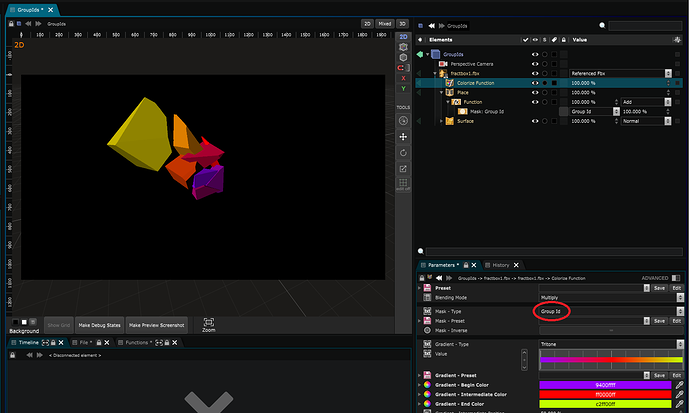 However, there is this closely related techniques that brings us one step farther: the Group Generators command enables to group multiple "3d generators" into a single one and then to display / apply effects on the grouped geometry. Thank you. Sounds like an interesting idea. Looking forward to testing your solution. Should be available in tomorrows' 7.4 beta! It's just great. I wonder if it will be possible to keep inside/outside UVs and materials after importing/referencing the fractured mesh? For materials you have the "side" option front/back/both that enable to have separate materials. I can't find the group id mask in the private beta. Are you sure that's the right build? Indeed, I'm afraid this build was made just before I commited the Group Id mask; arf! I don't have access to the build server right now, so you'll have to wait till monday to have it. OK. No problem. Monday is fine. 2) A good fracture scene requires at least 2 materials and 2 uv maps: inside and outside. I've made a simple scene in blender with 2 embedded textures (for clarity). The fractured mesh (meshes to be more precise) is on layer2. You can export the chunks as an fbx using the fbx export plugin included in blender (I can't remember if it's on by default).